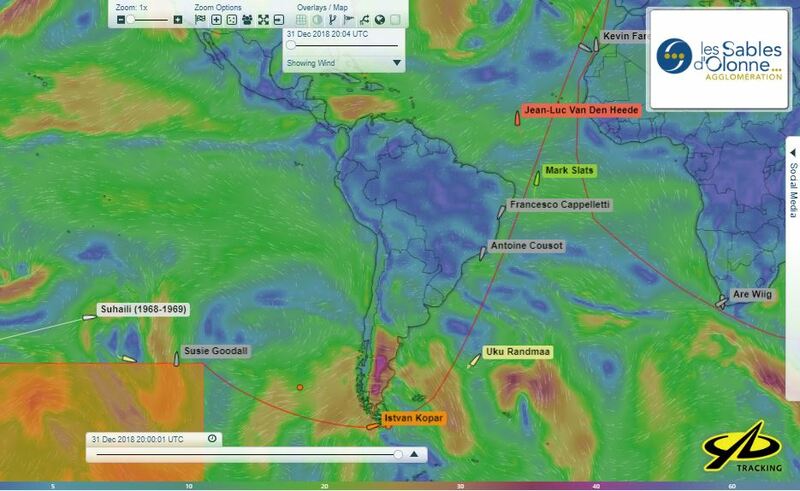 ISTVAN ETA at Cape Horn 1200UTC 1st January??? 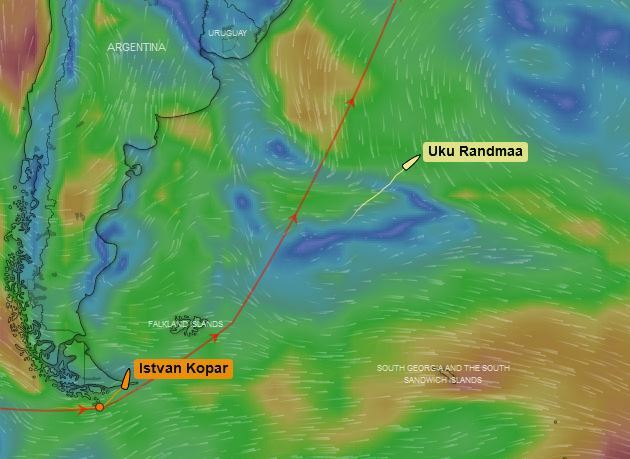 Uku Randmaa Golden Globe Race 2018 Golden Globe Race 2018 has been going nowhere for nearly two days as he was first confronted with the prospect of a severe storm about to form ahead of his track. He must turn back and head south to avoid it. Within hours the forecast changed and then changed again with computer models contradicting themselves. 24hrs later the storm arrived but fortunately he missed the worst of it with 45kt winds and 5-6mtr seas for just 8 hours, before being able to head north once again. 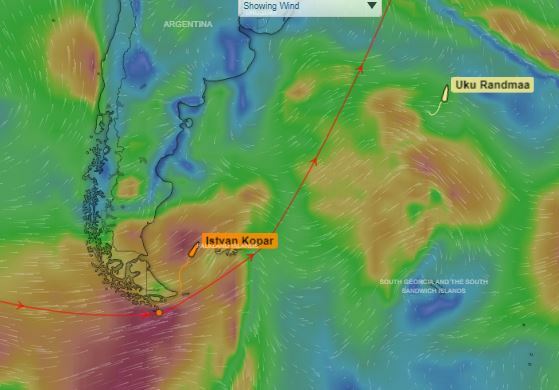 Istvan Kopar Solo Circumnavigator Solo Circumnavigator is getting ready for a BIG celebration around 1200UTC on the 1st January as he should be around Cape Horn by then. He has just 125 miles to go and the weather all looks reasonable for now. The sea is around 5-6mtrs constantly and winds averaging between 25-40 knts for the past 36hrs but no complaints as it is all from behind and his PUFFIN is moving well. 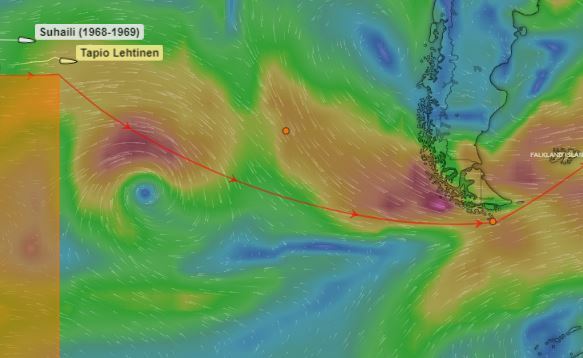 Tapio Lehtinen Sailing continues to make slow steady progress over the past few days with the forecast headwinds never arriving. He spent one day making small repairs to a few sails. He will be becalmed for New Years EVE with very light winds maybe and then start moving again for the New Year. Mark Slats reports all well onboard with no mention of problems with his mast base or Aries wind vane mounts so his repairs must be doing OK. 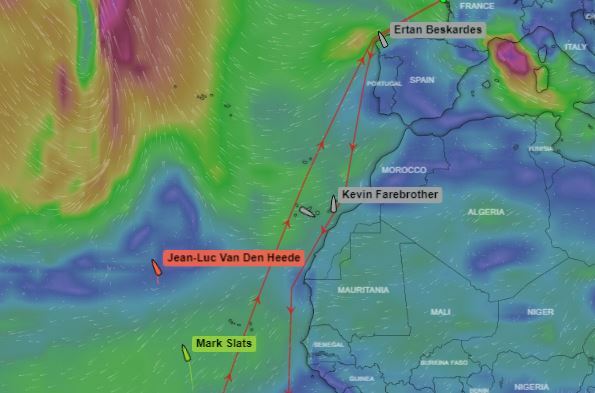 He is just 250 miles from the Equator and still trailing Jean Luc VDH by 975 miles, so he is having to work hard not just to catch up but for now just to keep up. He is making 6.5knts (one knot faster than JL VDH) with 25kts trade winds on the beam. The forecast is suggesting he will be able to sail fast through the area of the doldrums which for now have disappeared. 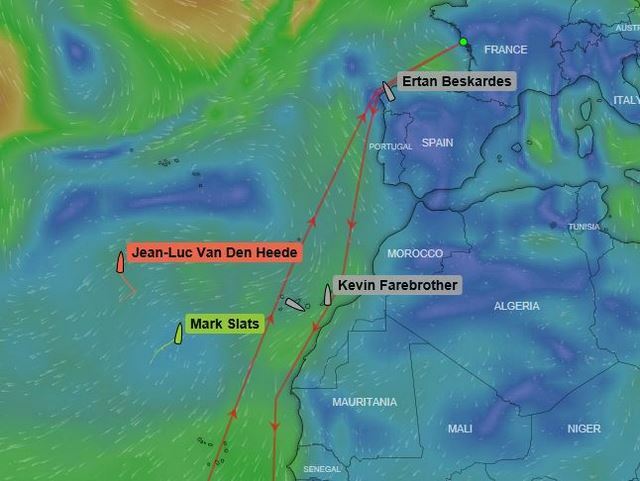 Tapio Lehtinen Sailing is feeling like Captain NEMO right now in a lonely Pacific Ocean all to himself now that ISTVAN is in the Atlantic and IGOR has not restarted. 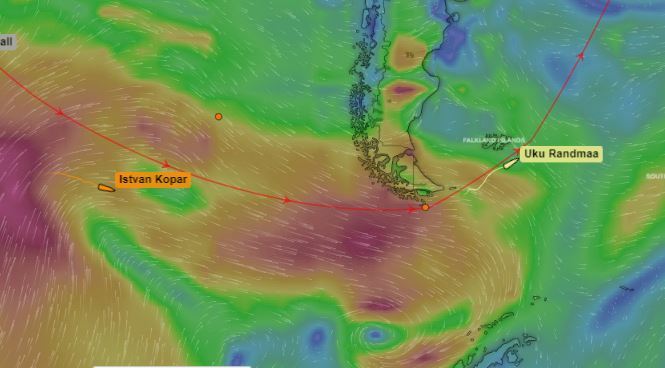 His forecast headwinds are just starting so progress is slow at 2.2kts on stb tack but he should Tack across soon to port and head SE with a strengthening NE wind that will send him faster on his way through the NO GO ZONE which is now open and on toward Cape Horn. 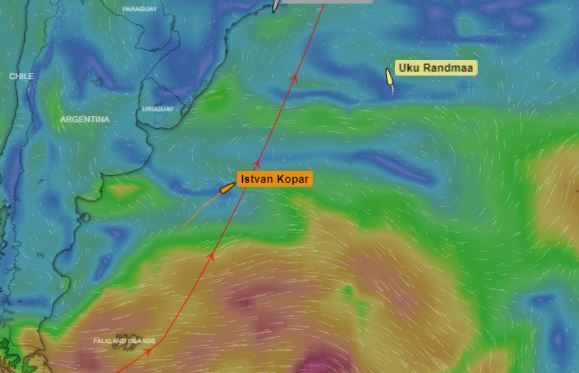 Istvan Kopar Solo Circumnavigator is still smiling in his new world and likely to catch more water today with rain forecast and great sailing winds sending him NE on track. 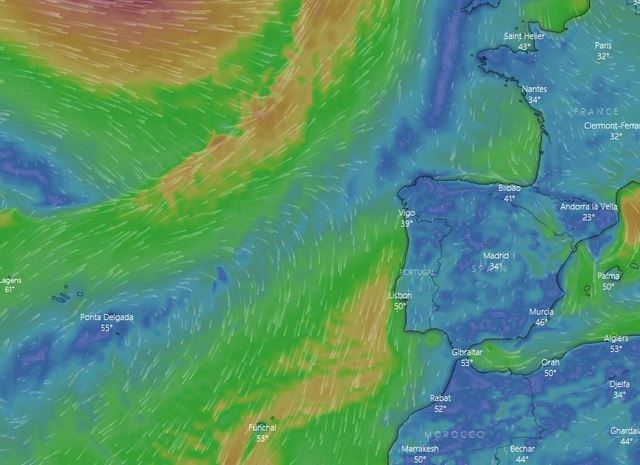 On the 6th his forecast headwinds will only last a few hours and then he is on his way again, so all is good right now as long as his steering gear box keeps rolling and his wind vane rope drum keeps turning. Uku Randmaa Golden Globe Race 2018 is winding down after his bush with a storm that is continuing to grow into a monster! as it moves away. His fast push North East paid off keeping his experience in the storm to about 9 hours only with no reports of damage, but a good story to tell later. Even today as he sails at only 3.7kts in 15kt winds the sea is still around 6 mtrs as it slowly dies down. It has only been in the last few hours he can relax as a BIG sea after the storm can be quite challenging. Winds are all favorable for the next for the next two days, but then he may be becalmed in warmer temperatures and possibly smooth seas. He still has a few barnacles not cleaned off since Hobart so will he will try again? One thing is certain, today he is relaxing after all the emotional energy spent with this last storm. Mark Slats has been eating plenty of fresh fish and slowed a little yesterday in unsettled Doldrum type weather with thunderstorms and squalls, but looks like he is clear into the start of the NE Trades now and once again sailing well at 5.9 kts. The trades should strengthen and become consistent in the next day or so and he will rapidly catch up to JL VDH as he now sails out of the Trades and will have to make new tactical decisions with the weather. He must also serve his 18 hour time penalty that will come up in the next 24 hrs. He is just 85 Miles from 20 North lat. The next week will be very important for both sailors as it will possibly set the scene for the run to the finish. If Mark can quickly make ground and move out into a similar weather pattern as JL VDH he may be able to hunt him down, but if JL VDH gets a break with the weather and makes good decisions and they enter this new area in two distinctly different weather systems it may be difficult? Mark loves the chase! He is 880 miles behind today with 2900 miles to the finish!! 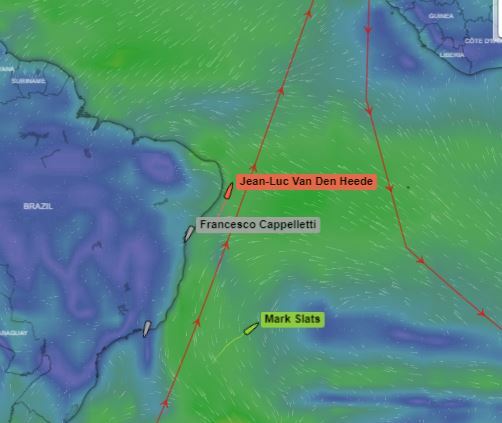 Jean Luc Van Den Heede is slowing down with the North edge of trade winds moving south sending very light winds. Often the Trades extends well past 20 North Latitude but not so today. 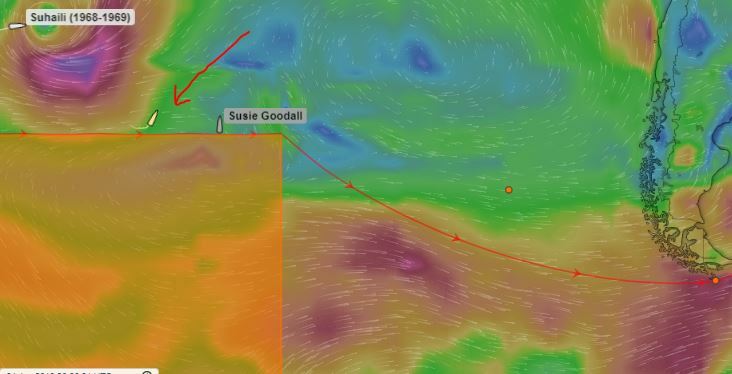 GGR will give him his time slot for the 18 hour time penalty when he makes his final approach to 20N and then he will have to tack back across and stay south of that line for at least 18 hours before continuing on. All is well onboard and a whole new race through the confusing weather systems ahead is about to begin. 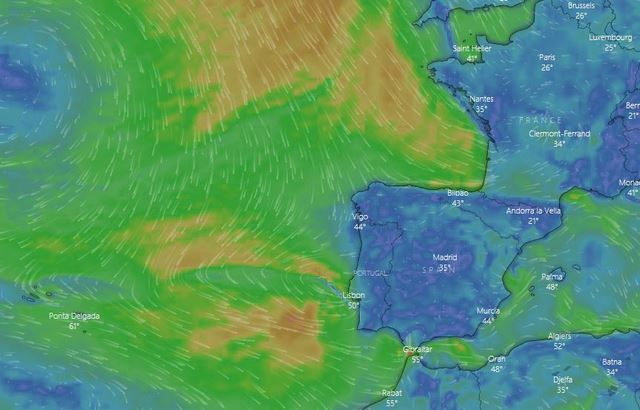 This is going to be very challenging and a wrong weather decision could cost much more than the issues of sailing slow with a damaged mast... watch this space...the RACE continues. 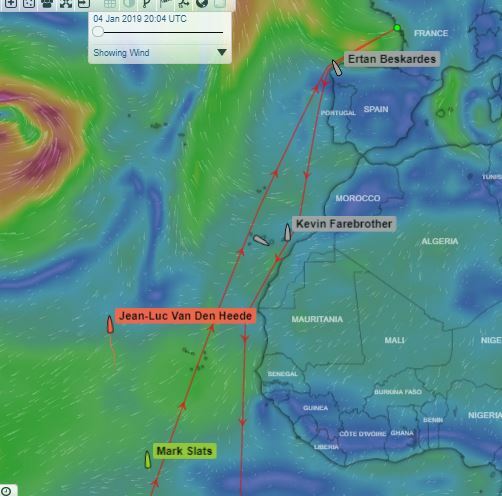 Tapio Lehtinen Sailing is now trying to head East and North as there is a storm approaching in the next few days. GGR have issued him the following weather alert ..MAKE NORTH every opportunity LARGE storm 11th at 2300UTC preceded by strong NW wind. Need to be 100 Miles North of present position soonest. GDLK..... The winds are dropping where he is and tomorrow it is expected to go very light before the northerlies start so it my be challenging to make speed north. If the Forecast holds true he will possibly experience the top edge of this storm and experience wind of up to 50kts but only time will tell. 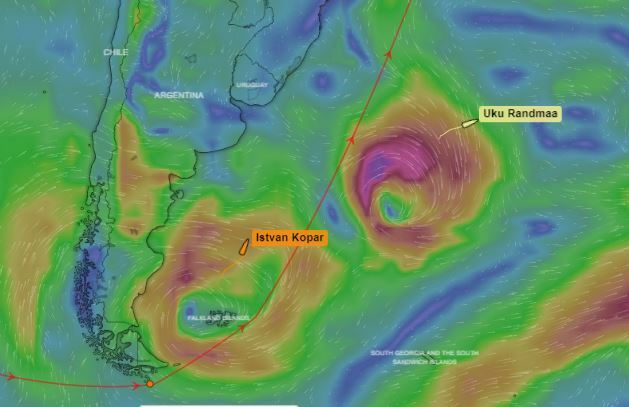 Istvan Kopar Solo Circumnavigator has heavy winds approaching his area. and was also issued the following weather alert today ....ALERT 1800UTC WNW wind increase 35kt 2400utc W 45-55kt @ 0600UTC 9th Jan. WNW 30-35kt BUT storm just south so get North when possible from now. GDLK. ... 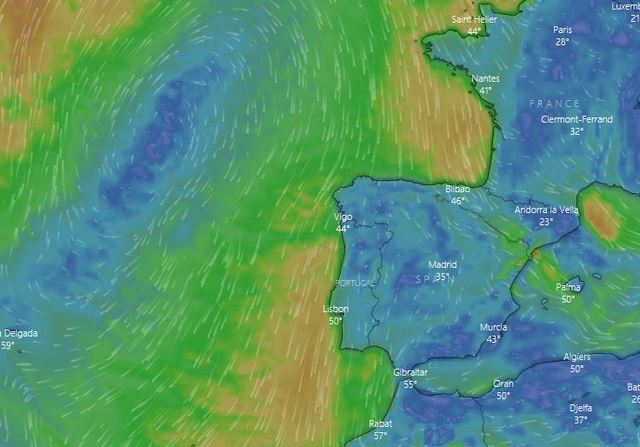 If the forecast stays true Istvan should be able to clear the worst of this and keep sailing fast in the right direction but he will have some windy days! 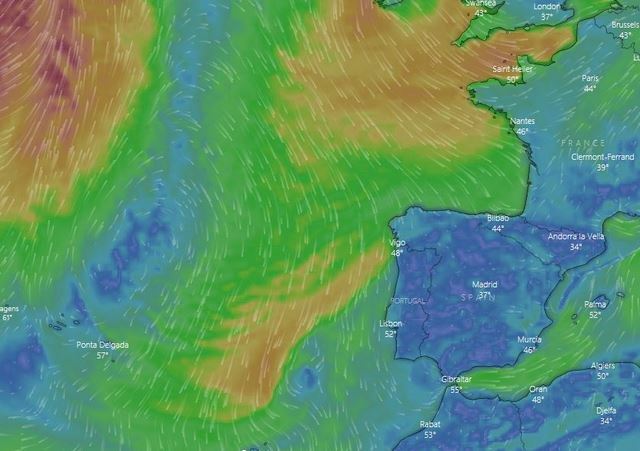 Uku Randmaa Golden Globe Race 2018 certainly attracts storms but this time it looks like it may help a little as a strong storm cell is set to pass close South of him over the next 24 hours and deliver good breeze to head North again after a day of frustrating head winds. 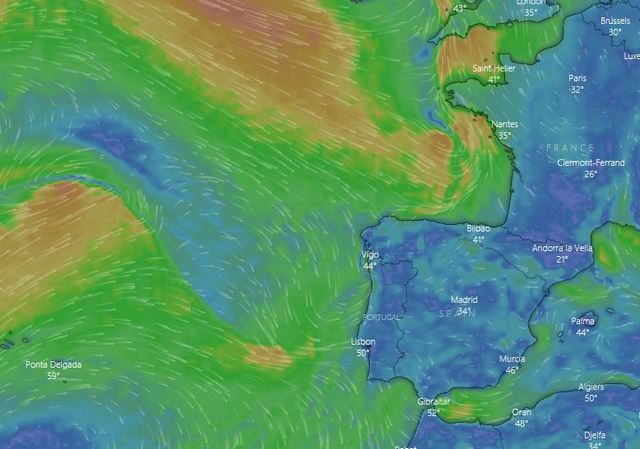 All is well onboard and in yesterdays weekly sat phone call he described how his last storm as quite severe running under bare poles with no sails up and towing warps with 60kt plus winds and large confused seas. He knows now he still has a long way to the finish and this adventure is far from over while anything can happen. So far so good and he sounds happy! 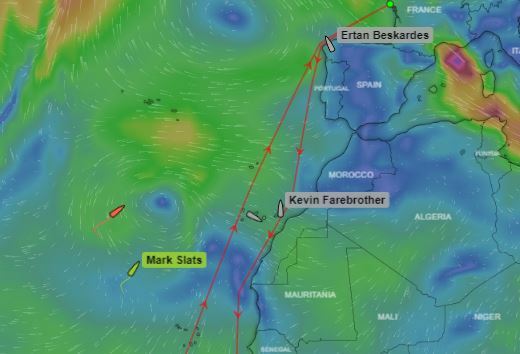 Mark Slats is pushing himself and his boat to the limit right now into 25kt winds and 3mtr seas. His challenge is to balance the desire for speed with looking after himself and the boat. he is a great sailor but this is now his biggest challenge. Not JL VDH! the weather is consistent and he is making an average 5.7kts every hour of every day heading in basically the right direction! things are changing in the RACE but it is still a long way to the finish and anything can happen. Jean Luc Van Den Heede frustration must be immense right now. He is creeping slowly forward in this no wind zone hand steering and concentrating. 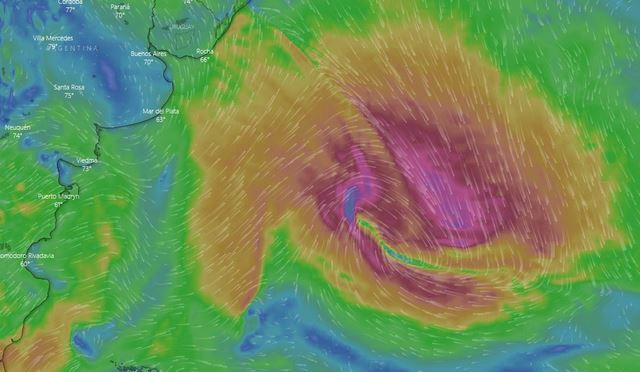 The forecast is impossible to pick small areas of local wind, so we do not know what is coming and nor does he, other than it will be light and this is more challenging that the Southern Ocean where you balance too much wind. He will get less sleep in the days ahead than maybe anytime in the whole voyage. He looks for ever puff and probably cannot sleep anyway. This NO WIND ZONE appeared on the 3rd January and will not leave until the 10th a one week hole! and it is not over yet. Seems like a long way to go to quit just because they wont let you play with your ham.